You are #1 Mom! Give this #1 Mom Ribbon to your Mom because she is the #1 in your life. The #1 Mom Ribbon is made of a red satin ribbon like material and reads #1 Mom in white and gold print. Pretty flowers decorate the ribbon in purple and gold colors. 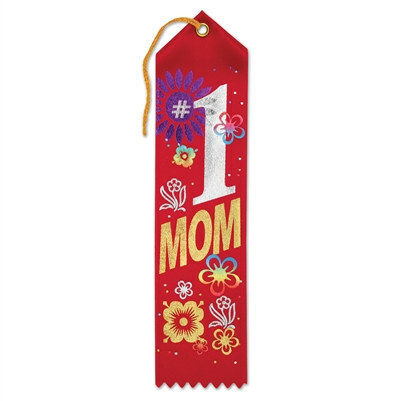 This Mom Award Ribbon comes to a point at the top of the ribbon has a brass grommet, and a gold string. The bottom of the ribbon is serrated. A reward card is attached to the back of the ribbon where you can fill in someone's name and the date. If you want to let your Mom know she is more than #1 show her in other ways too like with the Glittered # 1 Mom Tiara, the Cerise #1 Mom Rosette Award Ribbon or the Very Special Mother Award Certificates.